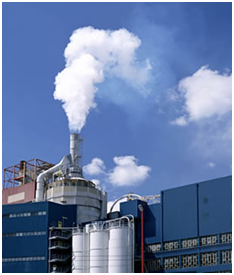 Our CEMS are used for the measurement of a number of pollutants from within the stack environment. Monitoring within the stack presents a number of problems due to extremes of temperature, velocity of sample and pressure. The common pollutants to measure are SO2, NO and NO2 whilst it is also used for monitoring CO, CO2, H2S and NH3. The extractive dilution technique is one of the most widely used method for continuous emission monitoring of SO2 and NOx it is also ideal for use in monitoring CO, CO2, H2S and NH3. It can be combined with a zirconium oxide sensor for the continuous measurement of O2. The extractive dilution system extracts a small sample of gas from the stack, removes particulates and then dilutes the sample with clean dry zero air, thus reducing the dew point so as to prevent condensation of water vapour and acid mist. The diluted sample is then sent down unheated umbilical lines to the base of the stack where it is analysed by high precision analysers. Due to the high sensitivity of these analysers, dilution doesn’t influence measurement accuracy negatively. In fact, accuracy is improved over other systems since water vapour cannot condense and remove part of the sample. Dilution lowers the dew point of the sample gas to below ambient temperature enabling it to be transported by an unheated umbilical cord. This eliminates the need for costly maintenance associated with heated sample lines. 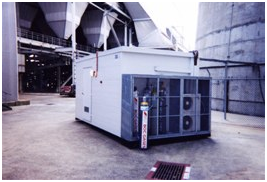 Other methods require large amount of sample gas, typically 2-5 litres per minute. However, the dilution extractive method requires only a small amount of sample gas, around 100 – 300 cc/min incresing the life of the filter and probe. A further benefit is the dilution of acidic stack gases substantially reduces the risk of damage to sensitive analysers. Other methods use a water removal system prior to the sample reaching the analysers. This process also removes part of the very water soluble sample gases, thus introducing an error into the measurement of SO2, NO2 and making it impossible to measure very soluble gases like NH3, HC1 and HF. The removal of water from the sample gas (extractive systems) alters the ratio of gases in the sample and a calculation must be performed to get “wet basis measurement”. However, by using the extractive dilution method moisture is not removed from the sample and measurements can be classified as a “wet basis” measurement without further corrections required. Gases: The extractive dilution system utilises high accuracy analysers from the Serinus range.